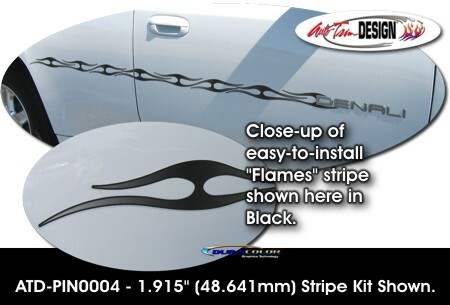 Dress up your vehicle with our unique Tribal design pinstripe tape kit. Available in a wide variety of print colors, kit includes eight (8) 96" (243.84cm) length strips that will easily apply to any clean painted surface. Visible width of pinstripe varies between .52" (13.20mm) and 1.2" (30.48mm). More than enough striping is provided for an installation on any car, truck or motorcycle. Tribal pattern is easily repeatable for a continuous application. Kit includes two (2) types of termination decals as shown. Easy-to-follow general online installation and care guide are available.